"Complete theme Manchester United fans might appreciate"
Among the most renown and mythic soccer clubs that count with numerous followers worldwide is without a doubt the famous UK one whose colours are red and white, namely Manchester United. So, as you reached this page and are reading this article, chances are you love this team enough to be interested in a dedicated Windows theme that will let you decorate your desktop and other aspects of your operating system. 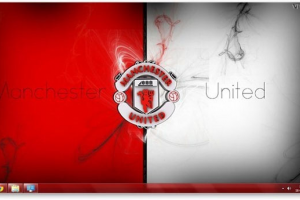 The Manchester United Theme is fairly complete and as such will change the overall colours of your desktop using red, it furthermore offers personalized icons and even encompasses a version of the official Glory Glory Man United song that will be played when launching your system. Last but not least, the wallpaper images included in the Manchester United Theme are 20 high-quality ones.